Have you ever made a photograph and then, later, you noticed something in it that made the image? This is one of those times for me. 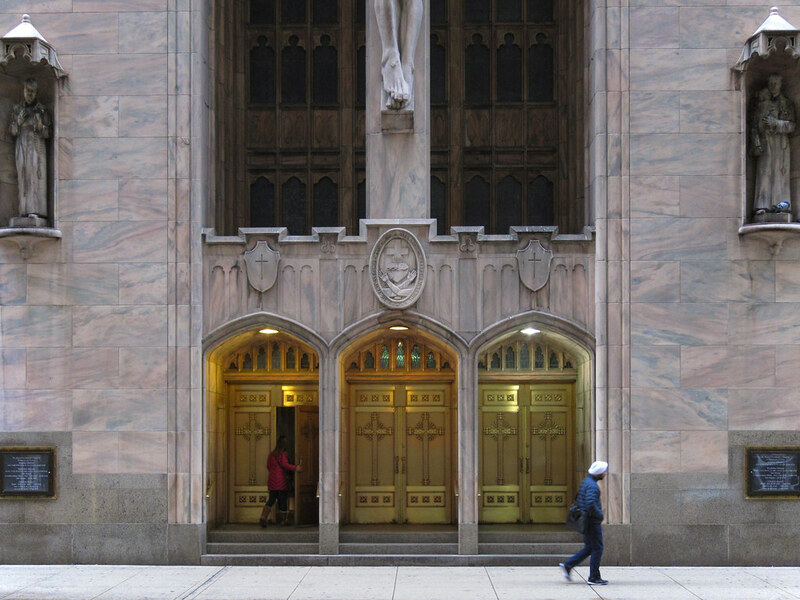 Margaret and I happened upon St. Peter’s Church, on W. Madison St. in the Loop in Chicago. It’s such a stunning structure that we had to pause for photographs. Madison St. is relatively narrow, and I couldn’t back up enough to capture the whole building. So I looked for interesting framing within what I could capture. The building’s symmetry appealed to me — my goodness, but do I love symmetry — so I went for that. Then today, while reviewing these images, I noticed the man in the turban passing by. What a joyful juxtaposition! When visiting our son in Chicago last summer, we attended mass there one weekday when we found ourselves in the area. It is very unlike any Catholic church I have ever seen. It was built in the early 1950s and is really beautiful inside, a unique combination of modern and tradional. Oh cool, we would never have guessed that this church was built so recently! Lovely shot. As nice a piece of street photography as I’ve seen in some time. Your composition and timing could not have been more perfect, even if it was a happy accident! What a very nice compliment! Thank you! Thanks Jim for your shot….the right moment in the right place! That seems to be half of the secret of interesting photography. Very nice. I even like how the woman in red and the gentleman in blue balance out in the photo. Yes! They do. Thanks Nancy! There really is so much going on in this frame, Jim — glad you revisited it. In addition to the turbaned man, I also love the woman in the red coat opening the door and walking into the church. And Jesus’ feet at the top of the frame, as if you’ve caught Him in the act of rising to heaven! It may have been a happy accident, but your composition makes it a great shot. I like the juxtaposition of the red-coated woman entering and the blue-coated man walking by, too! I hadn’t really noticed Jesus’s feet at the top. Funny what others can bring to a photograph! Yes, there’s lots to look at here! Thanks Susan!